Jones volunteered for a segregated military, as a woman she volunteered for the Women’s Army Auxiliary Corps and swore herself in at Hunter Army Airfield and served the United States Army for two and a half years. The Tuskegee Airmen were the first African American military aviators in the United States Armed Forces during World War II when African Americans were subject to Jim Crow laws. 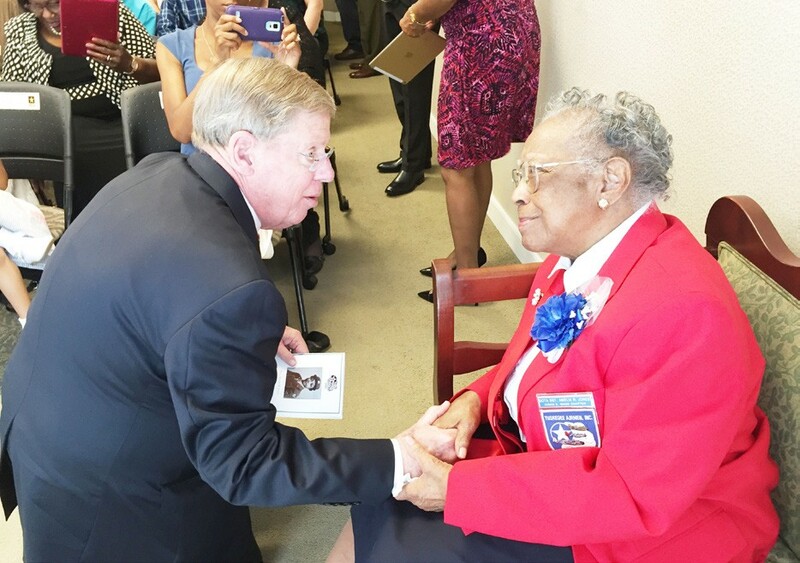 U.S.Senator Johnny Isakson from Georgia was honored to meet Mrs. Jones and when he heard her story, he was also adamant about making the presentation himself. While the Congressional Gold Medal was awarded to the Tuskegee Airmen in 2007, she was unable to receive it because she was unaware that she qualified as a Tuskegee Airman at the time. Amelia Jones enlisted in the army in 1943. Seventy years of not being recognized, surviving members of the Tuskegee Airmen Dr. Roscoe Brown and Lt. Col. Alexander Jefferson were awarded the Congressional Gold Medal presented by President George Bush on March 29, 2007. This award is given to men and women who have performed an achievement that has an impact on American history and culture that is likely to be recognized as a major achievement in the recipient’s field long after the achievement. Nearly 8 years later the Tuskegee Airmen are still being honored through Jones, history was being made awarding an African American woman for her time protecting this country. “As an African American woman, Mrs. Jones broke two glass ceilings when she decided to join a segregated military in World War II. I was determined to meet this military hero and present her with this recognition myself because I wanted to personally thank her for the great contribution she made to our country and our history,” said U.S. Senator Johnny Isakson.